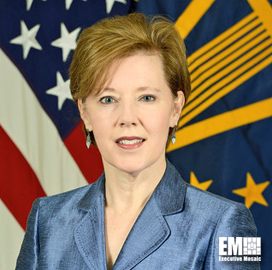 Lisa Hershman, acting chief management officer of the Department of Defense, told Defense News in an interview published Friday that DoD is focusing on five key initiatives to find greater savings in fiscal year 2019. Those programs are category management; information technology and business systems; procurement of goods and services in a different manner; health care management; and logistics and supply chain acquisition. “Those are our big ones. Now, what we’re looking at is not only how we do things, but we’re looking at those processes, we’re looking at policies, systems and then resource alignment,” she noted. One of the lessons she has learned during her first year within the CMO office is ensuring cost savings without hampering customer experience. She said her office also looks at quality levels, cycle times and ways to reduce duplication. Hershman said the CMO office found $4.7B in combined savings for FY 2017 and FY 2018 and has teamed up with the comptroller to come up with a process to validate the savings from working capital funds. When asked about the department’s annual audit, she noted that the CMO office has been conducting biweekly meetings in order to keep up with corrective action systems. “We’ve actually created for the audit a common database of corrective action plans in order to track the execution of the corrective actions,” she added.